Our sod cutters are enjoyed by many professionals; Landscapers, Parks & Recreation Supervisors, Cemetery Administration, Baseball & Softball Field Maintenance, Rental Centers and Cement Contractors. Our cutters are very popular with the "Do it Yourselfer"; a few uses include cutting in a new garden area or trenching for Fido's new invisible fence. They are lightweight, easy to use and need no gas or oil to operate. 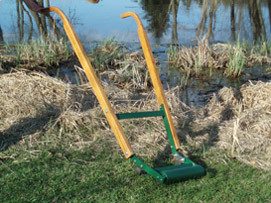 All that's required to operate the cutter is a simple kicking motion on the green cross bar while using the handles to push and direct the cutter's path. The total weight of our cutter is only 26 lbs, which makes it easy for anyone to operate. At Quail we believe that the "hands on" approach is the best way to ensure quality. Our cutters are hand made in the U.S.A. with no foreign labor; this is something that's almost unheard of in today's market place, by the time one of our cutters is sent out it has been inspected many times over. We are so sure of the quality in our products that we back them up with a 10 year frame guarantee! In fact, many of the cutters built in the 1950's are still in service today.